Google's Director of Engineering for Android David Burke has told in an interview for "The Verge" that Android 4.4.1 KitKat update is coming and it's bringing several improvement for the Nexus 5 camera. He confirmed that the smartphone's camera will now focus faster and will aim to select faster shutter speeds, not relying as heavily on its OIS as it does now. 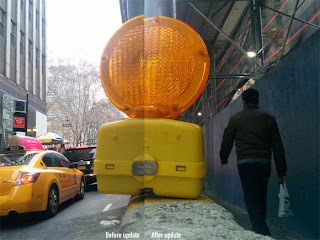 This means that post-update images produced with the Nexus 5 will have less motion blur and camera shake, but will probably be noisier than they are now. The white balance and exposure algorithms have also reportedly been improved. Check out a comparison shot showing the same photo taken before and after the update. Besides the improved image quality, the camera app itself will launch quicker, too. In fact, it does so a full second quicker than prior to the update. The app packs a new progress indicator in HDR+ mode, which shows you how the photo processing progresses. Burke says the update took his team 5 weeks to complete and in that time they've managed to pull off a lot of work. The update is also fixing the face unlock bug of the Nexus 5. Currently, using facial recognition occasionally causes a bug with the camera app, which requires a reboot in order to start running normally.